1) Get a spiral-bound, A5 notebook. It's the only kind that not only stays easily flat open, but they completely fold in half and have thick cardboard backs, making it easy to hold them one-handed when you don't have a table. Muji sells relatively inexpensive ones that are of a good quality. Midori is another brand I really like for spiral-bound ones. Midori "polar bear" spiral notebook. Muji fountain pen. Lamy safari. Kaweco sport. TWSBI Mini. Rhodia is a favorite of many, but their spiral-bound notebooks (e.g. the very popular DotPad) have side perforations to allow to remove pages, unfortunately, these are very weak and will detach. Not good to carry around, only for temporary notes/scratch. Stitched (threaded binding) and taped notebooks are the second best, they easily lay flat because only a few pages are stitched together, then these groups are bound together with tape. Notebooks held with only staples in the middle are the least flexible. 2) You might want to prefer more absorbent paper for quick notes on the go. 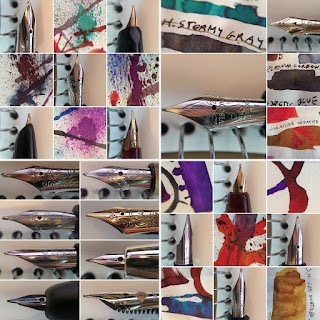 Usually, fountain pens are used with smooth, non-absorbent paper that helps to avoid bleed-through, feathering, and allows the ink to dry over time, bringing out the eventual shading or sheen. 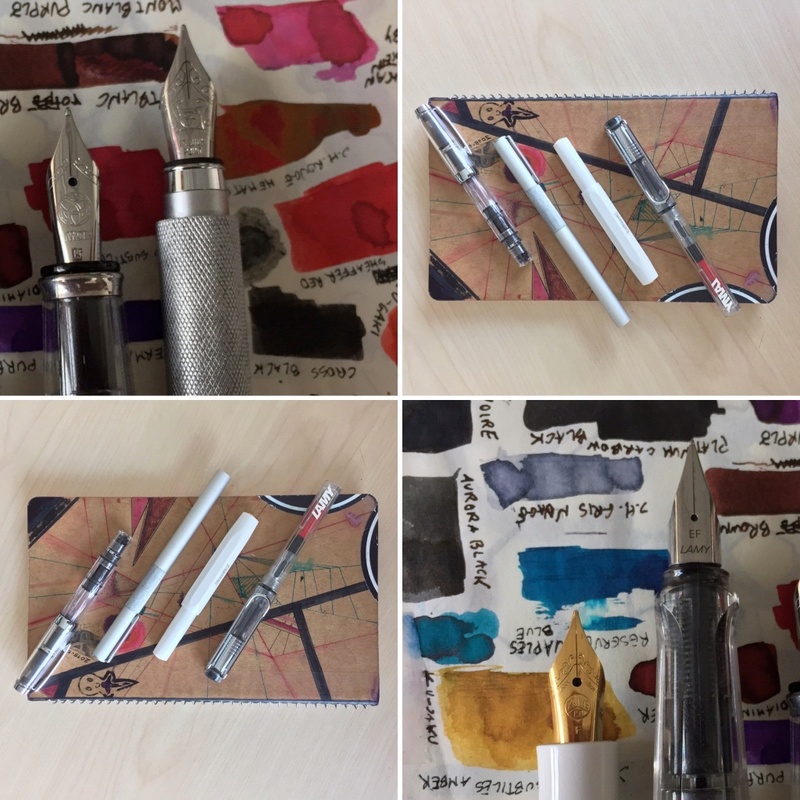 Unfortunately, this might not be the best for quick note taking (even if I don't mind it at all, the dry times are still quite fast with fine nibs), there are absorbent papers out there that work great with fountain pens. The Midori Cotton notebook is an example. I also usually buy only notebooks with blank pages, not lined or gridded. 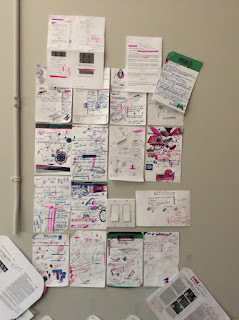 That's because I tend to draw lots of diagrams and write smaller than the lines. A Midori Cotton notebook, threaded binding. Lamy studio and a Faber Castell Loom. 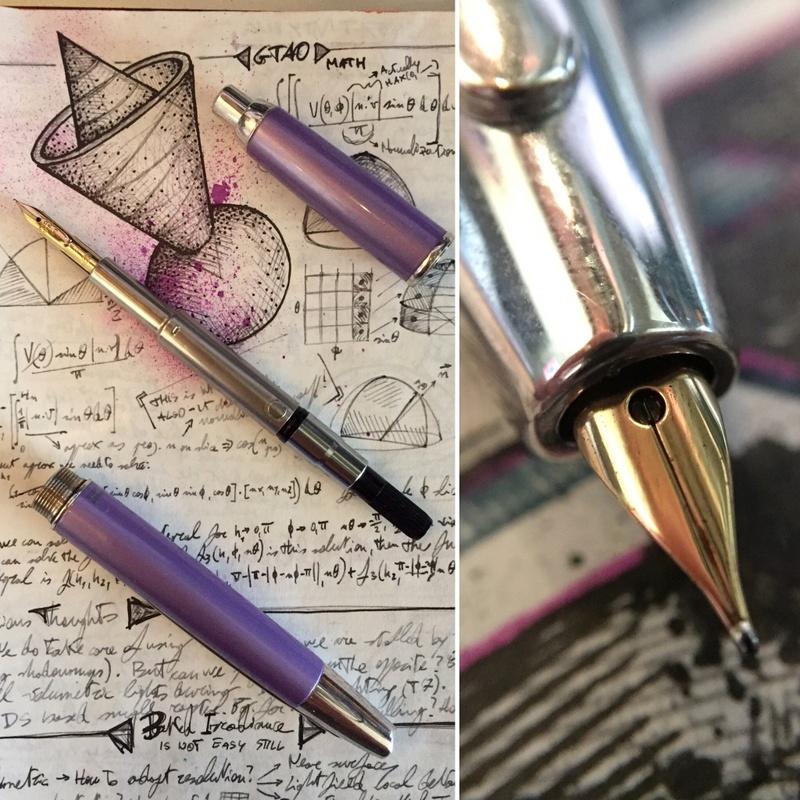 3) The best fountain pen for daily notes is a Vanishing Point (fine nib), bar none. 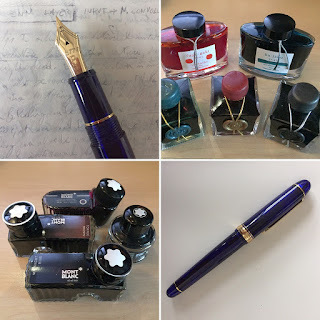 I have a fair collection of fountain pens, but nothing that touch the Namiki/Pilot Vanishing Points (a.k.a. Capless). 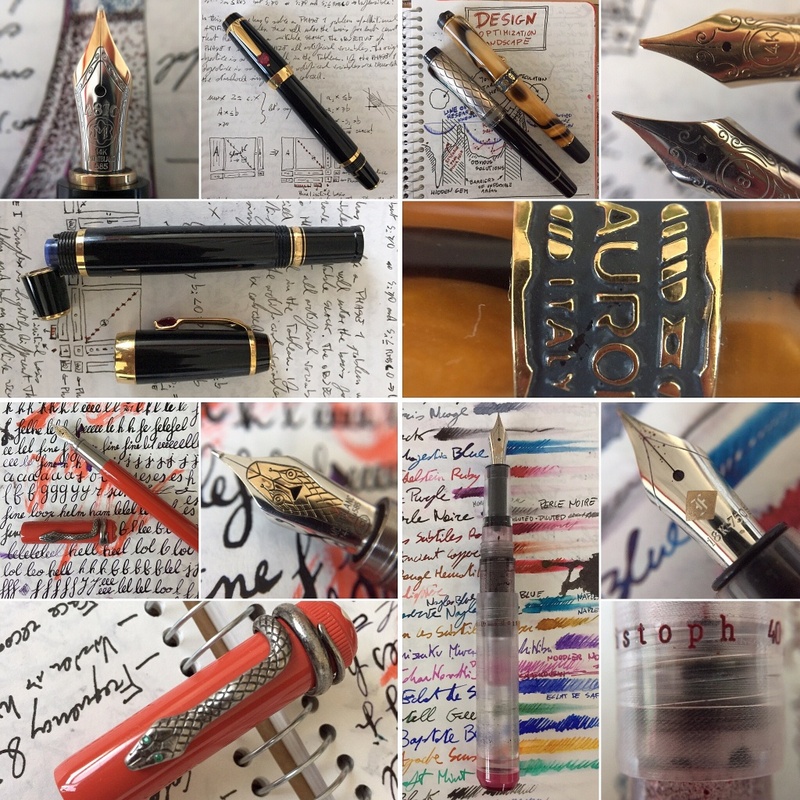 They are incredible writers, especially in the smaller point sizes (from medium to extra-fine, which are the ones you'll want for notes). 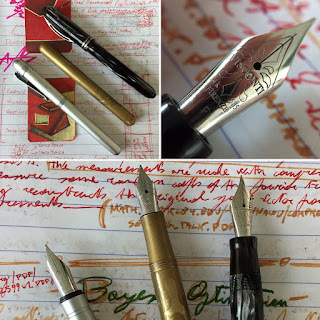 They are fast and clean, due to the retractable nib, and they don't spill in airplanes either (to my experience, you might still want to travel with pens mostly full/without air bubbles and keep them upright during the trip). The Capless Decimo and its bigger brother, the Vanishing Point. 4) The best cheap fountain pen is the Muji aluminum pen. This might be actually hard to find, I got one from a store a year ago but never found another one in my subsequent visits since then. I have the longer model, not the foldable one (which is somewhat worse). It's very cheap, it writes very well, it's not bulky but it's very solid, it works well in planes and it can easily hold a spare cartridge in the body. 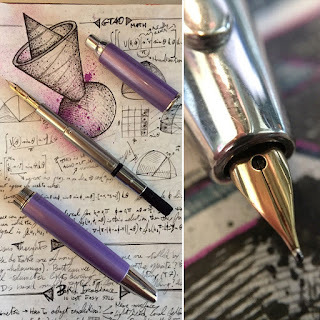 I also like that it uses a screw-on cap, which is a bit slower to upen but will ensure that ink doesn't get suddenly suctioned out the nib (as some tight push-on caps do, by creating a vacuum). The only downside is that it's fairly skinny, which might not be too comfortable for some. 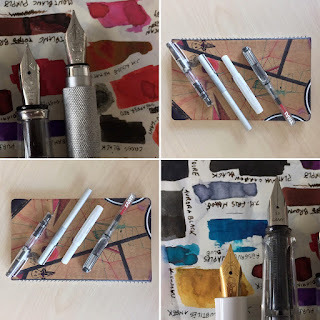 Alternatively, a starter pen that is as good (or maybe even better, my only Muji might have been an outlier...) is the Lamy Safari, a solid, no-nonsense German performer. It's a little bit more expensive than the Muji one, but it won't disappoint. I hear great things about the Pilot Metropolitan as well, but I personally don't own one. 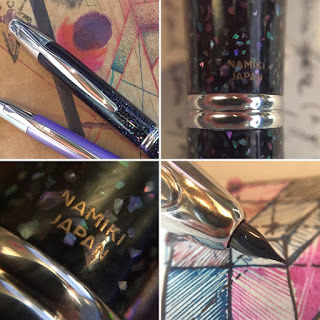 Namiki/Pilot is probably, though, my favorite brand. 5) If you write a lot, avoid very thin and short pens. Once upon a time, I used to love very compact pens, and still today I won't ever buy too bulky ones. But I did notice that very thin pens stress my hand more. Prefer pens with a decent diameter. A brass Kaweco Lilliput and a Spalding and Sons Mini. 6) You might want to prefer a waterproof ink. Inks are most of the fun in playing with fountain pens! Inks that shade, inks with sheen, inks with flakes, pigmented inks, iron-gall inks... all kinds of special effects. It's all fun and games until a drop of water hits the page and your precious notes are completely erased... Extremely saturated inks might even smear just with the humidity from the hand! So, especially if you're on the go, the best ink is a waterproof or at least water-resistant one, and one that flows well while drying fast. Often, the more "boring" inks are also the best behaved, like the Montblanc Midnight Blue or any of their permanent inks (black, blue, gray). My personal favorite, if I had to pick one, would be the Platinum Carbon Black, it's the best black ink I own, it flows perfectly, it's permanent and looks great. 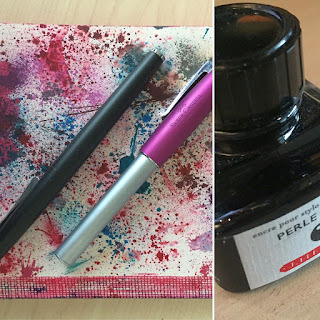 Unfortunately, it's a bit harder to clean, being a pigmented ink, so I use it only in cheaper pens that I have no problems dismantling (it's a perfect match for the Muji pen). I tend to prefer cartridge converters in my pens and I usually fill them from bottled ink with a syringe, it's less messy. 8) You won't look back at most of your notes. Taking notes for me is just part of my thinking and learning process. I like it, and as I don't have a great memory, they work as some sort of insurance. I have a notebook with me at all times, and every time I finish one, I quickly take photos of all pages with my phone and store them in my dropbox account. Easy. I still find much easier to work on paper than with my anything else when it comes to notes and diagrams, so much that I will even often just draw things on paper, take a photo with an iphone and send it to my computer during discussions with co-workers, to illustrate a point. That said, unless the notes are actual, actionable things I need to follow-up on (e.g. meeting notes, to-do lists, ideas to try, sketches for blog posts), I mostly don't look back at them, and I gather that this is common for most people. So, be aware of that! 9) Stick a few small post-its at the end of your notebook. I always have a small number of different shaped post-its at the end of my notebook, so if I need to put a temporary note on a page, I can. I also use small removable stickers as bookmarks, often. Another thing that I sometimes do, is to use both ends of a notebook. One side, e.g. from the front, I use for "permanent" notes, things that I am fairly certain about. 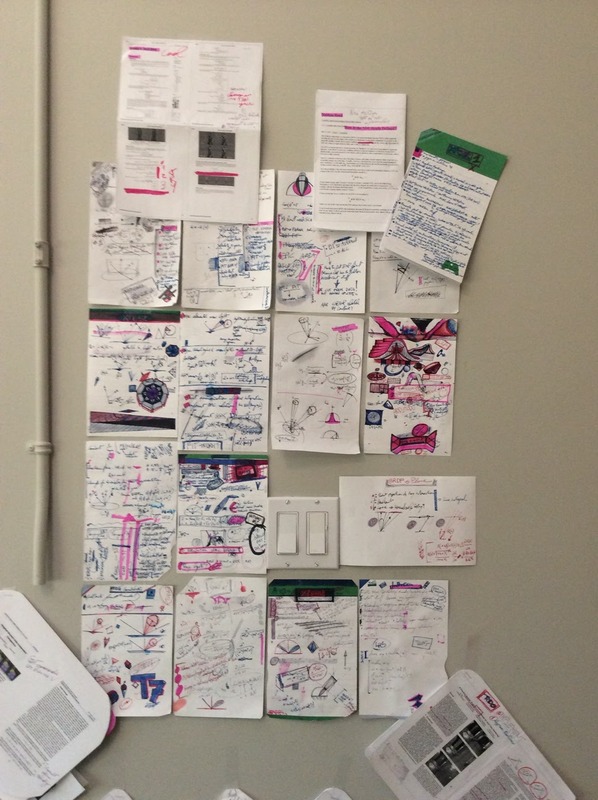 Meetings, summaries of things I learn, blog posts and so on. 10) Try not to go too crazy. 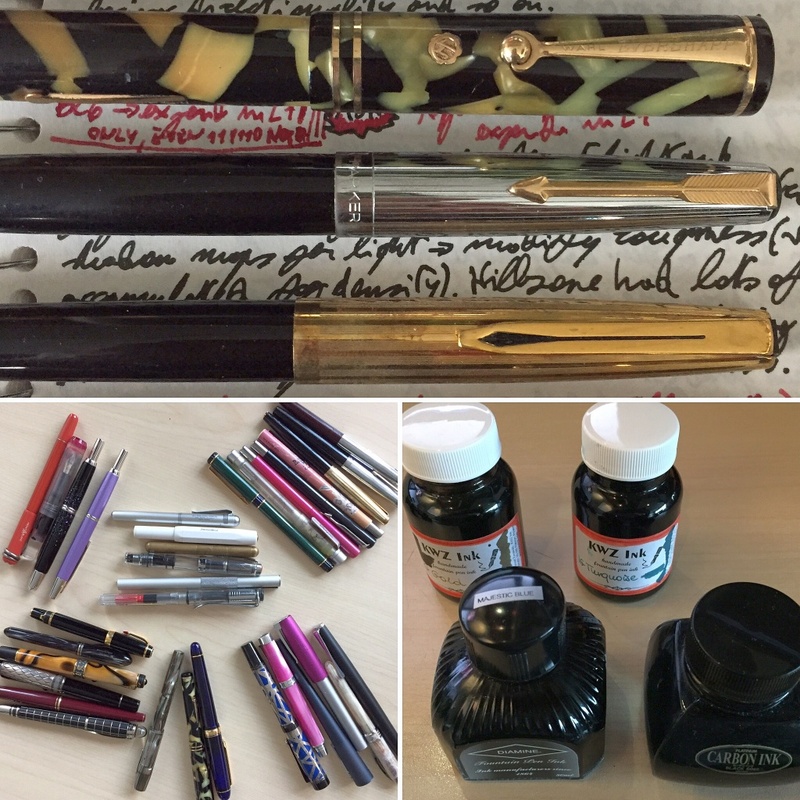 Fountain pens can instigate a compulsion to start a collection, easily. That might be good or not, depending on your point of view. But never fool yourself into thinking that there is a rational need for expensive pens. 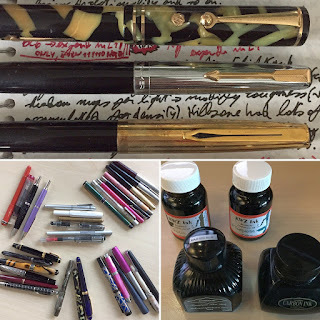 Truth is, fountain pens are already a useless luxury, and lots of expensive ones are not really great writers, certainly not better than some good cheap ones. A pen is a pen. I'm Italian, and I grew up in a family of what you could call middle-class intellectuals. My parents came from proletarian families, and were the first generation being university educated, not working in the fields. A teacher and a doctor, embedded in the life of the city and involved in local politics; we used to often host people over for dinner. And I remember, at the time, being fairly annoyed at how people could be highly regarded for their knowledge and intelligence even if they were limited to the sole study of the humanities, without knowing even the basics of math, or scientific thinking. Fast forward and today, as a computer science professional, society in my small bubble seems to have undergone a (non-violent) cultural revolution. Today "nerds" are considered "smart", the lack of social skills almost a badge of honor, and things seem to matter only when they relate to quantifiable numbers. Not always, I have to say the professional world of smart computer scientists is not a stereotyped as your average Hollywood portrayal, yet too often we live in a world that is yet again too vertical: programmers, artists, managers, often snarking at the other categories lack of "skills". "We wanted to build an elegant, robust, and beautiful product"
I've been wanting to write this post for a while now, I have various sketches in my notebook from almost a year ago, but recently I found this very well written post-mortem analysis of RethinkDB failure as a startup. I'm no database expert, but what I found particularly interesting is the section talking about the design principles behind their product. You want to make a new database product; what is that you're going to focus on? For RethinkDB, the answer was three key factors: correctness, simplicity of interface and consistency. Seems pretty reasonable, databases are the central infrastructure for most of today's applications, and who would like to build a billion-dollar product on something that doesn't guarantee correct operation? And definitely, today's startups need to move fast and are willing to adopt whatever new technology that helps to get results fast, so simplicity and consistency could give a competitive advantage. This misjudgment led not only to the demise of the startup but also to a lot of frustration, depression, and anger, as what could be seen as inferior products made big impacts in the market. The sin is, of course, the idea that an abstract notion of beauty matter at all. We write software to achieve given results, and these results are for all but the most theoretical of works, something that somehow has to make people happy. Everything else is just a mean towards that, a tool that can be used well or not but not a goal. The goal is always to sell to your market, to do something that people will... like. It requires understanding your customers and understanding that we are all people. It's the clash between "features" and "experiences". When we think about features it's easy to end up in the measurement fallacy. We are doing X, and we are doing X measurably better for certain axes of measurement than another product, thus, we are better. Wait for adoption and success. This is the peril of living in a verticle bubble of knowledge. People in tech think about tech, we work with it, we create it, it's easy and to a degree even inevitable to start technology for technology's sake. But the truth is that user experience, workflows, and subjective experiences are about technology, and they are about research and computer science. They are just -harder- problems to solve, problems that most often have no good metric to optimize at all, sometimes because we don't know how to measure "soft" qualities, but many times because these qualities are truly hard to isolate. Good design is humanistic in nature, we have to understand people, what they like, what they fear, how they use technology, how much they can adapt to change, what risks they evaluate. Objectively good is not good enough. Good design makes objective sense but overcomes also emotional, social, environmental obstacles. Computer Science should be taught together with sociology, psychology, design, interactive arts. To be fair though it's not surprising that people who are deeply invested in a given field, don't fare well in others. The tension between vertical knowledge, specialization, and horizontal knowledge that allows us to be well-rounded, is ineluctable. We are more and more pushed towards specialization because our fields are so deep and complex, and even the most brilliant minds don't have infinite mental resources, so there are always tradeoffs to be made. Whether you went to a university or not, chances are that to become a specialist you needed a deep, technical immersion in a given field. We isolate ourselves into a bubble, and to a degree, we need to. The real problem begins when we start thinking that a given bubble is representative of the world, that because given qualities matter inside it, they actually do matter. When that starts, then we start adopting the wrong metrics to judge the world, and we end up frustrated when the world doesn't respond to them. Bubbles are of course a very general problem, even a very scary one when you think that really our world is becoming more and more complex to the degree that's not easily explicable even by experts, it's not easy to encapsulate in a set of rules. Complexity can push us inwards, to simplistic explanations and measure of goodness that we can become very attached to, even if they are very narrow-sighted. It doesn't help that we, as humans, seek confirmation more than truth. Take for example the world of academia and scientific research. Researchers are judged on novelty, what a paper really needs is a measure, then, given such measure one can assert that a given technique is objectively better in a given context. If something is better, but not in a way that is easily measured, it's not something that can be easily published. This is not per se a terrible problem, it becomes a problem when we start thinking that these measures are all that really matters. I work in computer graphics; if I make a new system that generates simplified 3d models, and all the artists that use it think it's revolutionary, it produces a much better output and it's easier to use than anything else, did I make something novel and noteworthy? Surely yes, that's, in fact, all that matters. But if this notion of how much better it is can't be measured in some kind of metric, it's not something that can be considered a novel research in academic terms. This is the nature of applied research, but it also creates a disconnect between academia and the rest of the world: a bubble, that we have to be aware of. When we ignore the existence of the bubble, frustration arises. Industry professionals are frustrated when academic research doesn't end up "working" for their needs. And researchers are frustrated when they see the industry "lagging behind" the theoretical state of the art. Is it all bleak? To a degree, yes, it is when you realize that the world is not easily reducible to comforting measures that we like. That biases are inevitable, that specialization is inevitable and bubbles are inevitable. I say that "experience is a variance reduction technique", we become more predictable and entrenched, better, at doing something, but we pay a price to it. What we can certainly do though is to at least -aware- of these mechanisms. Doubt ourselves. Know that what we think it matters, might not matter at all, and seek different point of views. Know that what we think is rational, most of the times is just a rationalization. Be aware of the emotional factors in our own choices. What we can certainly do is to break -a bit- out of our vertical pits of knowledge, and be just curious enough, learn just enough to be able to interface with different people. That can be just the solution we need, we can't know all, and we can't really understand the world without any filter. We can though make sure we are able to talk and engage with people that are different, that invested their verticality in other fields. In the end, personally, I don't consider my journey towards being truly "smart" complete or even really started. But at least I am a bit aware... I also have the gift of a spouse that beats me down showing me how bad I still am at many aspects of "smartness", and a strong enough ego to take that beating. Small steps.